1) Client pays an enrollment fee of $55 for each pet that they wish to enroll in the Free Vaccines for Life Program. 3) The enrollment fee is for one pet only and is not transferable to another pet. 4) The enrollment is transferable to a new owner only if the pet has been permanently identified with a microchip before transfer. 5) Enrolled pets will continue to receive vaccines listed on this form free of charge as indicated for the rest of the pet’s life as long as the pet has an annual wellness exam at Rainbow River Animal Hospital within 30 days of when the wellness exam is due. 6) If the pet does not come in for the annual wellness exam within 30 days of the due date then the pet is dropped from the program. The client can re-enroll the pet by paying the enrollment fee again if the program is still being offered by Rainbow River Animal Hospital. 7) Once a pet is enrolled and comes in for annual wellness exams yearly, that pet will receive Free Vaccines for Life. 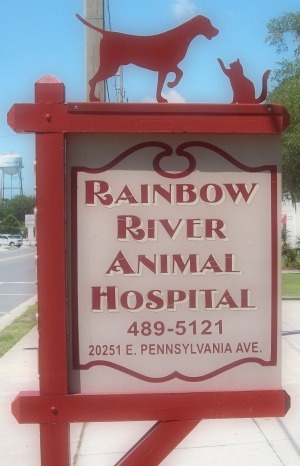 Rainbow River Animal Hospital reserves the right to stop enrolling new pets or re-enrolling lapsed pets. 8) At the annual exam the veterinarian will discuss the vaccines appropriate for the age and lifestyle of that pet and recommend a vaccination program. The client has the right to refuse vaccines except Rabies which is required by law. Any vaccine not listed on this form is not included in the program and will be charged for. 9) All exam fees, lab fees, medications, heartworm prevention, flea treatments and all other veterinary charges are not included in this program. Client must pay for the doctor’s exam fee to receive the free vaccines. Only the vaccines listed on this form are free. *If I purchase the program from you can I use it at any other veterinarian? No, the Free Vaccines for Life is exclusive to Rainbow River Animal Hospital. *If I have more than one pet do I get a discount on other pets? No,unless you sign up the other pet for the program. *Can I transfer the policy to another pet? No, the policy is for one pet. You can enroll multiple pets with a fee for each pet. *If my pet dies or runs away shortly after enrolling can I get a refund? *If I give away my pet will the new owner be able to use the policy? Yes,but only if the pet is permanently identified with a microchip before you give it away. *What happens if I do not make it in for a wellness exam before my year passes? There is a 1 month grace period before the policy becomes void. This may be extended by the Veterinarian if the pet is examined and it is too ill for a wellness exam/vaccines when they are due. If the policy lapses, the pet can be re-enrolled as long as we are still offering new enrollments in the program. *Can I get free vaccines without an exam? No, the pet must be examined by the veterinarian and the exam paid for when vaccines are given. Exception can be made for Bordetella vaccine only if the pet is healthy and has had a recent exam. *How often do puppies/kittens need an exam/vaccines? Young puppies/kittens need to be examined for each vaccine, usually every 3 weeks until they finish their first year vaccines. They are growing and changing rapidly at this age. *What other discounts come with the Free Vaccines for Life program? Only the vaccines are free. There are no other discounts with the program. All other yearly tests, medications,illnesses and preventatives still need to be paid for.